We are developing a new BIOMIMESYS® hydroscaffold for neuronal cells. First results are very promising because neurons grow and form neurites. Moreover cells lived longer than in monolayer culture. We are currently finalizing this new hydroscaffold to find the best conditions of 3D neuron culture, but BIOMIMESYS® Brain will be soon on the market! We tested 2 neuronal cell lines, SH-SY5Y (adrenergic cells) and Luhmes (dopaminergic cells) in BIOMIMESYS® Brain. Because of the 3 dimensions, numerous cells are required for the seeding, between 50 000 and 200 000 cells per well, like in other BIOMIMESYS® matrix. Both cell lines grow in the hydroscaffold and form spheroids, with intra and inter-spheroid neurites. 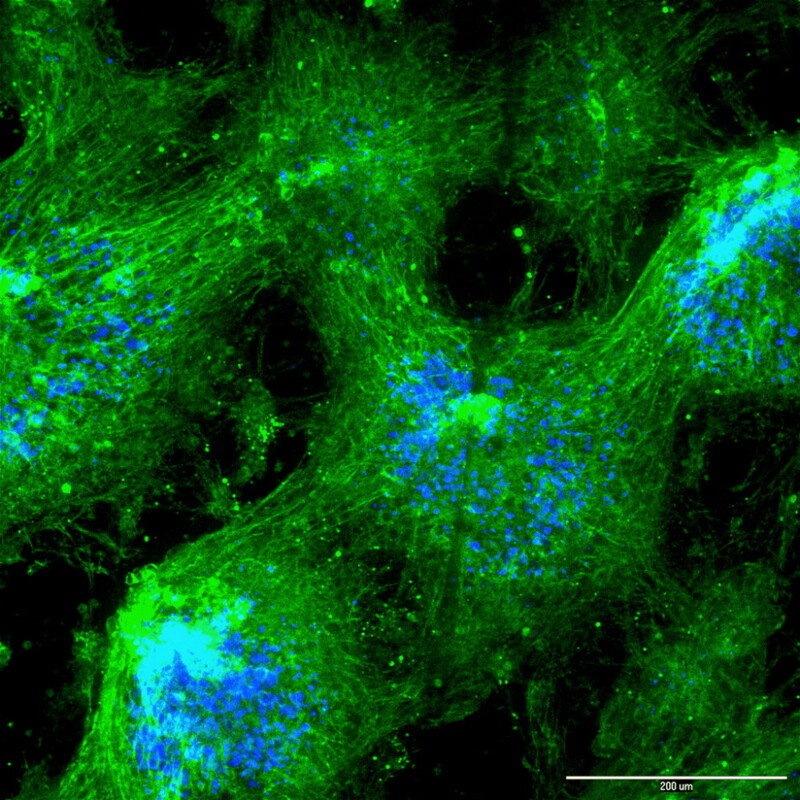 These cells can live three weeks in BIOMIMESYS® Brain hydroscaffold, versus one week in 2D culture. BIOMIMESYS® Brain could be use to develop healthy or pathological models, which will be more relevant than existing monolayer models, by including the cellular microenvironnement. Moreover the long survival of cells in the hydroscaffold will allow studying chronic effect of molecules (toxics or therapeutics) on the brain. Therefore BIOMIMESYS® Brain could be very interesting model for in vitro studies of complexe neuronal diseases like Parkinson or Alzheimer disease! If you are interested in BIOMIMESYS® Brain, feel free to contact us for more informations !